You have just assessed 2 year old “Tommy” at your clinic. He presents with severe expressive and receptive delays and has little to no single words. Does this scenario sound familiar? If you’re a practicing paediatric speech therapist/pathologist you most likely have met this child at some point during your profession. If not, be prepared; he/she is coming. The question is where do you go from that point? What type of intervention approach do you use? What words do you teach him to use first? Many of us immediately start banging our knuckles together saying “moooore.” However do we have a basis for choosing this word as part of our “first faithfuls”? Some therapists have argued that “more” actually isn’t a very functional word to learn, whereas others believe it is the most functional for children’s everyday interactions. Our next #slpchat, therefore, will discuss some of the considerations in choosing the first words to teach to children with expressive language delay. Owens(2004), notes that an important consideration in choosing words for a first lexicon is that words are functional and fulfill a broad range of communicative purposes. We want to teach children words that they can use often to accomplish their social goals. Lederer (2002) expands this to include not only functionality, but also developmental norms, motivation, lexical variety and phonological information. Many researchers have compiled their lists of vocab targets for children with language delay. Some contain familiar items within a child’s environment such as names of family members, body parts, preferred foods or toys, while others expand to substantive and relational words as is shown in the table below by Bloom & Lahey (1977). We’d like to hear from you! What are you using in therapy? Are you following any particular research/ hierarchy? Join us for the #slpchat on April 10th, 2011 at 2pm ET, where we will be discussing these vocab choices, as well as your own considerations for early vocabulary, whether it be through verbalization, sign language or any form of AAC. 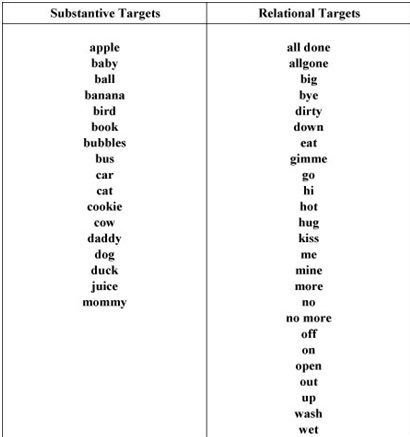 We also wish to look at the types of intervention techniques you use to target this vocabulary. Lederer, S.H. (2002). Selecting and facilitating the first vocabulary for children with developmental language delays: A focused stimulation approach. Young Exceptional Children, 6(1), 10-17. Lahey, M., & Bloom, L. (1977). Planning a first lexicon: Which words to teach first. Journal of Speech and Hearing Disorders, 42, 340-350. Owens, R. (2004). Language Disorders, (4th ed.). Boston, MA: Allyn & Bacon. Paul, R. (2006). Language disorders from infancy to adolescence (pp. 301-305). St. Louis, MO: Mosby. There’s a new hot topic on the fingers of tweeters in the #slpeeps community. It has been making its rounds across various conversations and everyone is eager to learn more. This topic? Cycles! Some of us may or may not have heard of it while in grad school. Others may have dabbled in it a few times in sessions or modified it to fit their interpretation of phonological therapy. Then there are those who live by it, and use it consistently as their primary intervention technique for phonological disorders. One such person is Speech Pathologist, Mary Huston, on whom the #slpeeps have bestowed the title ‘Cycles Guru.’ Trained by someone who worked closely with Dr. Barbara Hodson (one of the developers of the Cycles program), you may have noticed her twitter handle @mtmaryslp imparting a wealth of information on the principles and practice of this program. Many of the professionals have even been trying to persuade her to give a web session on Cycles. I was lucky enough to have the opportunity to have a skype ‘tutorial’ from Mary, and have been using the program in my sessions ever since, with success! Over the past few weeks we have been encouraging her to feature as a guest blogger in the slp blogosphere. She graciously accepted this request and has written an amazing post on phonology and the ‘how, when, and why’ of Cycles. This can be accessed here. Read Mary’s article on Cycles found here. Read the journal article below, if you can find access. ASHA members can click here. Be sure to check your professional association or regulatory bodies as well as your local library – many have access to online journals now! Hodson, B. W., Scherz, J. A., & Strattman, K. H. (2002). Evaluating communicative abilities of a highly unintelligible preschooler.American Journal of Speech-Language Pathology, 11, 236-242. This would give you a couple of weeks to read and prepare for it and maybe even try the program out in a session or two by the time we have our discussion. We’re looking forward to hearing your views,experiences and questions, and learning from you as we all continue in our professional development. Invite all of your slpeeps and let’s make our first event a great one!